“America to Me,” the extraordinary ten-part docuseries currently airing every Sunday on STARZ, is the latest triumph from Kartemquin Films, the Chicago-based company responsible for many of the best American documentaries over the past half-century. Steve James, the Oscar-nominated filmmaker behind “Hoop Dreams” and “Life Itself,” sets this series at Oak Park and River Forest High School, a diverse and progressive institution where racial inequity has nevertheless festered throughout the generations. Segment directors/cinematographers Rebecca Parrish (“Radical Grace”), Bing Liu (“Minding the Gap”) and Kevin Shaw (“The Street Stops Here”) assist James in providing a richly textured portrait of various teenagers representing the 3,400 students enrolled at the school during its Fall 2015-Spring 2016 semester. Among the most staggering achievements of this program is its brilliant editing, a mammoth balancing act taken on by no less than five skilled storytellers. 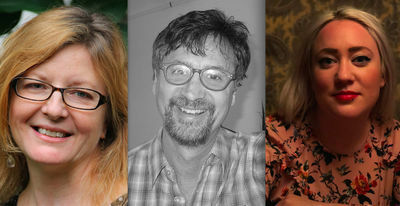 Leslie Simmer (“As Goes Janesville”) and David E. Simpson (“Abacus: Small Enough to Jail”) served as co-editors alongside James, while Alanna Schmelter (“Walk All Night: A Drum Beat Journey”) and Rubin Daniels, Jr. (“Life on the Trail”) provided invaluable support as co-editor/postproduction supervisor and associate editor/postproduction coordinator, respectively. Simmer, Simpson and Schmelter recently sat down with RogerEbert.com for a lively roundtable discussion on the nature of their collaboration, their approach to interweaving an enormous array of story lines and why the experience of making this show has proven to be life-changing. How was the work balanced between you three, Steve James and Rubin Daniels, Jr.? David E. Simpson (DS): Leslie and I started editing in February 2016, while the shooting continued through May. Rubin had been on the project since mid-July or August, right near the beginning of the shooting. He was in charge of ingesting all of the footage—massive amounts that grew every day—into the Avid editing system, and organizing it for us. Alanna Schmelter (AS): The directors gave him field notes to help us when diving into that much material. Leslie Simmer (LS): It was definitely an evolutionary process. At first, David and I were going to be doing the mammoth part of the rough cutting, but then Alanna jumped in and worked with both of us. Rubin also started helping with the rough cut, and before we knew it, Alanna was working at the episode level as well. Throughout the process, we were very much creatively collaborating, and it all just snowballed over time. DS: We started out by dividing it up into characters. Leslie and I each took a couple of characters right off the bat, and we both would fight over Alanna’s help. DS: You bribed her. That’s why I always lost. [laughs] We would go up to Alanna and say, “I can’t deal with the Jada [Buford] subplot here. Can you do it for me?” She took on pretty much all of Jada’s scenes early on, and loved cutting the Spoken Word sequences. We had certain territorial, character-based areas that we would each dive into for the first half-year or so. AS: Each of us gravitated toward certain material, and we’d be like, “Hands off, everybody!” It worked out because everyone has different sensibilities. I was immediately attracted to Jada and the Spoken Word stuff. Kendale [McCoy] and I were also a match made in heaven. LS: I grabbed Grant [Lee] right off. He wasn’t one of the first people I was assigned to, but I definitely made it clear that everyone had to keep their hands off him. I’ve spent so many years cutting stuff that was really heavy. When I was editing “The Homestretch,” which was about homeless teenagers in Chicago, I would just burst into tears and sob at my desk for hours. I’d literally have to get up and take a walk before returning to work. Grant didn’t have any baggage beyond being a freshman in high school. He’s got two very committed parents who love him and are guiding him well, and they were hilarious. Every time I would look at more footage of them, I would be laughing in my edit room—not at them, but laughing joyously at the fact that I got be part of his freshman journey. How has your past work informed your approach to this project, particularly your films featuring young ensembles? LS: I’ve always worked with multiple characters, and they’ve frequently been young, as in “Raising Bertie” or “The Homestretch.” Everything you do prepares you for the next thing. What was beautiful about this was regardless of the fact that there may have been territoriality about our characters, we were all at a certain point very much collaborating on how scenes should change. Everyone had their hands on most of the scenes, so a lot of things were moved around through the full wash cycle of the editing. DS: That is absolutely true. At a key point in the process, the editors shifted from being character-based or narrative arc-based to episodic in terms of focus. There was some debate about it, and there’s no perfect point to make that jump, but it had to happen. At that stage, we’d take over whatever scenes happened to be placed in a given episode during the first cut, which of course changed over the next year. As the episodic editing continued, we kept moving these various parts around. We would adopt each other’s scenes and have our way with them. There would be a scene I’d watch over the last few rough cut meetings that I’d always want to try something with, and then I’d have the opportunity to see if it worked. Leslie and Alanna would have their way with my scenes too, and it could get touchy at times, but I think we all behaved like relatively mature adults working toward a larger common goal. It was no longer about “my scenes,” but “our series.” We all respected each other’s editing capabilities and sensibilities so much that it never truly got touchy. And we all loved each other, so that helped. AS: Totally. If there was something that I felt sensitive about, and I knew that I’d be handing it off to someone else, I’d go over and discuss what scenes were playing well for me, and whether they could be explored even further. DS: Or we’d go to each other and say, “I’ve been wanting to do this, but I know that you’re sensitive about this part of the scene. What do you think about it?” We could really check in with each other and find what worked for everyone. AS: Often I’d be like, “I’ve been thinking about that too,” or, “That needs to be eliminated in service of the larger piece. It doesn’t make sense anymore.” Once you see the scenes in place with everything else, it becomes glaringly obvious that it can’t exist like that anymore. So the footage evolved and got tighter as we went along. DS: All of us have done many projects where our modus operandi is the interweaving of an ensemble in a vérité, multi-wheeled story. This project was like that—but on steroids. DS: It was a whole different level of complexity because usually when you are interweaving, you are thinking from an early stage about how certain scenes will work alongside others, and what the structure may potentially look like. In this case, it was very hard to determine anything in terms of structure during the first half of the editing. All we could do was build “bricks”—our term for building blocks—that we could place in a certain logical order for a given character’s story, be it Kendale’s story or Ke’Shawn [Kumsa]’s story. But we really didn’t know how to fit those bricks into the house for a long time. For a while, there was no blueprint. LS: Things that we thought were really set would change late in the game. Up until the very end of the editing process, we thought we’d be bringing Kendale in during episode one, and then all of a sudden, that got thrown up in the air. Kendale was held off until episode two, and everyone was like, “Woah, how is that going to work?” You’ve got to have a lot of trust. Steve would be orchestrating some of the more radical changes. We had all made suggestions about what could go where, but Steve has a tendency to walk that tightrope a little farther sometimes. He’ll say, “My instinct tells me to do this,” so you have to just trust that. DS: He’s a madman. [laughs] He would drive us crazy. LS: Initially in episode one, Charles [Donalson III]’s interaction at the lunch table with the other guys, where he talks about not having a father, was followed be a scene at the barbershop, where you found out a little bit more about that relationship he had with his dad. That got disassembled relatively late in the process. Now instead of finding out about Charles’ father, we learn about Charles’ relationship with his mother, which in many ways makes more sense. DS: There are just so many ways to dice it and slice it. One of the few comparable experiences in my career would be my work on “The New Americans.” That was a seven-hour series about immigrants starting a new life for themselves in the U.S., though it had more or less a built-in time frame. Everyone came in from the old world and arrived here. There would be the initial shock of their new living situation, and then they’d try to find their place in American society. In this case, we had some chronology—there were certain things that tied into seasonal events like Homecoming, etc., but so many of the characters’ personal arcs could be played with. There’s very little that was set in stone. Was that shift from character to episodic editing reflected in the show’s overall structure, which goes from focusing on a few students in early episodes to about twelve main characters by the end? DS: That’s a good and tough question. LS: One of the first things that we did was to try editing the scenes that we thought really captured a character’s arc or were pertinent to their story. We had a sense of what would be important, even though we didn’t know precisely where we were starting or ending with most of our people. The scope of the show was sort of built-in, but the idea of who to bring in where was something that we really wrestled with, and particularly with the white students. A lot of feedback we were getting was from people who wanted to bring them in sooner, but we hadn’t started shooting with them until much later because it took a long time to actually get their permission and find who were willing to participate, as is noted in the show. We didn’t have enough footage with them from the first semester, so there was a built-in necessity to bring them in when we did. We could’ve tried to include them a little bit sooner, but considering the way that it organically works through the second half of the series, it was a good decision to introduce them in episode five. I believe that by connecting with certain students early on, the act of bringing in new students won’t cause the audience to lose the thread of the students that they had met first. By having more people and finding interconnections and juxtapositions between their stories, our job was to keep that flow moving so that we were hitting the right emotional pitches and having a cohesive sense of each episode as its own journey as well. AS: When you are deep into the details, it’s difficult to have an idea of the micro and the macro—big picture, small picture—simultaneously. It was great that Steve would have ideas for the big picture because my perspective often wouldn’t be at that level. He would always have a viewpoint of what was coming down the line. When you couldn’t see the forest for the trees, he would counterbalance that. DS: It’s hard to see outside of the trench sometimes when you are down deep in it, and it’s muddy at the bottom. For much of the project, I was aware of how I was in a trench. Steve could see beyond it, as could Rubin, to some extent, by virtue of him being the one who had to organize all the footage. They had a better wide angle view of the entirety of it than I did. On the last third of the project, once we had finished the very first rough cuts of the entire series—which were still subject to a lot of moving parts—we thankfully began to get a broader sense of the project, and got to participate every day in conversations of how this entire epic story should be told. I really cherish working with a director like Steve. One of his virtues is he’s a really good collaborator. He’s strongly opinionated, as we all are, but he can really share that decision-making floor while respecting his collaborators. We had a lot of fun arguing stuff out. LS: Since Rubin had seen so much of the footage, he had this larger picture of it and was constantly reminding us of things that caught his eye. I want to give him props for discovering one of our subjects, Jada. He was watching her in class, and told us, “Jada is awesome, you’ve gotta follow her.” Luckily, Steve listened. Kartemquin specializes in making films about important issues without turning them into “issue movies.” The truth of the subject matter is conveyed through the subjects themselves rather than on-the-nose didacticism. DS: For sure. In fact, I’d say there is a thirteenth main character in the film—actually, more like a thirteenth through fifteenth—which is the administration and the meta-level of how the school is functioning. We have moments in the series that reflect the conversations about how this school is functioning outside of the student’s lives. These are our portraits of the security guards, the lunch staff, the school board and curriculum subcommittee meetings, etc. For the most part, that “thirteenth character” was Steve’s. He was the one who generally filmed that stuff and had the greatest handle on it. It was important to all of us that these extra layers of complexity would be in the film, but I think we were always cognizant of how we layered it in. It’s a little bit of medicine and it doesn’t go down as easily. At what points and in what proportions do you layer it in for it to be most meaningful and most easily swallowed by a viewer? LS: At the beginning of this process, I was skeptical as to whether or not we could make entertaining television that people would really want to connect with if we were going to be taking the camera into school board meetings. Yet I feel at the end of the day that those were some very dramatic scenes. They not only brought up issues in a very clear and immediate way, they also just gave you much greater context of the school itself. AS: While sifting through the footage, you’d start to see formations of scenes that could potentially fit into the focus of a specific episode. There was one in particular—episode eight—where we touch upon how the parents go about motivating their kids. DS: We’d sometimes find that an episode was too heavy or “red meat,” which was our term for on-the-nose discussions and struggles around race. Some of our cohesive handles for episodes were along the lines of, “This is the Gabe [Townsell] episode, because he really comes alive in this one,” or, “Episode two is a strong Kendale episode because it begins and ends with him.” That is part of the juggling act of having so many characters and so much footage. You can’t throw the kitchen sink at every episode, and that was particularly tough in episode one. There’s a universal problem in starting any feature film, which is the question of how to start the first ten minutes. In our case, the first hour was like our first ten minutes. It’s a problem because you want to convey to the viewer all the information they need to know to understand what kind of film they’re watching and how many different facets it’s going to have. You’ve gotta be weary of overwhelming them, and I think in our first cuts of episode one, we were overwhelming the viewers with too many characters and too much going on. LS: We had to cue people into the fact that this is going to be entertaining, but not misdirect them into thinking that there aren’t serious issues that will be explored and resonating throughout the series. That was a long wrestle. I love the early shot of students welcoming the viewer into the school, with the words of Langston Hughes’ poem, “Let America Be America Again,” juxtaposed over the footage. DS: We always knew that’s how the episode would start, but the words definitely came later. AS: We had a graphics person onboard, and I think it was his idea to put the poem in at that point. Since that poem was the impetus for the title, it was really important for viewers to see it and connect with it right away. I think it adds a completely new layer of complexity. Was it a challenge seamlessly juxtaposing the work of four different directors/camera operators? DS: I don’t think so. You could ask the same question about us, since we each have our own stylistic traits as editors. By the end, we all had our hands in practically every scene, so we all, to some extent, sanded down or added our stylistic contributions to pretty much everything. Each of the filmmakers’ individual strengths as directors and camera people were fitted to what they shot. For example, one of Kevin Shaw’s strengths is shooting sports with a long lens. He’s done a lot of work for ESPN, so he was a natural fit for Kendale’s story and all of the wrestling scenes. Steve picked these folks really well. AS: As a younger editor, I had so much to learn from Leslie and David in terms of their style and experience. It was really interesting to watch their scenes and ask myself, “Would I have made those choices?” Leslie would always surprise me with the choices she made, because she would never go the easy route. David loved playing visual games. At some point, we were going over one of my scenes, and he said, “I believe that an edit should be a distinctive clash from one cut to another, where you create energy from a cut.” I just took it all in and learned a lot from the both of them. LS: But you came with a lot of skills yourself, Alanna, and you added so much to the project. I particularly admired your work with music, montages and the interstitials that you did, as well as how passionate you were about the Spoken Word footage. DS: At the micro level of two shots joining together and at the more macro level of two scenes or two sections coming together, there are different ways to skin that cat. You could either try for a fluidity or a mirroring or a similarity—allowing one thing to echo or mirror or somehow flow from another thing seamlessly—or you could go another route and try for juxtaposition and clash, creating energy that way. I really enjoy putting two shots together in a way that maximizes that clashing energy, even in terms of the elemental aspects of a shot. The ideal cut for me is going from a lower angle close-up of somebody facing right to a high angle wide shot of somebody facing left to maximize the contrast. Even at a subliminal level, it does something for me. Leslie and I have been around Kartemquin for a long time and have edited a lot of things under its auspices. Even before Kartemquin, we came from a place of devotion to the Direct Cinema tradition, so working together on common projects has molded us into relatively the same universe of editorial styles, where you prioritize somebody’s direct voice in vérité situations while building scenes that have a narrative feel to them. I remember hearing a quote from a jazz musician who said that he can listen to a dozen different saxophone solos, and know exactly who performed them because their saxophone voice mirrors their human voice. I can’t hear that because I’m not at all steeped in that world. But you could probably put me in a vacuum and show me a scene that Alanna or Rubin or Leslie or Steve has cut, and I could tell you whose fingerprints are on it. We do have those distinctive traits. They would be hard to pick apart, and it would take a while to lay down what makes me think a particular scene is Alanna’s. As I said, we all have our fingerprints over it by the end, but there are still certain parts of the show where I was like, “Damn, nice choice Leslie,” every time I watch it. The same could be said about identifying the distinctive voice of a writer. LS: I’m going to say something really controversial here: it’s my very firm belief that editing is writing! Couldn’t agree more! At what point was it decided that “America to Me” would be a ten-part show? AS: Once you start getting comfortable with the work, you think you have a grasp on what you’re doing. Then it would grow, and it would continue to grow. I imagine that’s what it’s like to work with Steve all the time. I would just be getting comfortable with one task, and then be faced with a whole new one and think, “How are we ever going to pull this off?” And then, you just find the room to do it. That’s what made this project so exciting. LS: We did have the conversation about what we were going to do for the epilogue, and realized that would be an entire episode in itself. AS: They would’ve been like 15 half-hour episodes. What are your thoughts on how certain critics have been reviewing “America to Me” as a film rather than a series? DS: “O.J. Made in America” skewed or blurred that line regarding what constitutes a film or a show. We live in a culture where a series is seen as TV, so it’s actually kind of surprising and refreshing to me that some reviewers are thinking of it in a different way. I’ve definitely taken note of how many people have referred to it as a film. LS: I’m always happy to have it called a film. I mean, it is a series, but I think the term “series” raises some kind of expectation in people’s minds. If people are jumping on the film bandwagon, I think that’s definitely a plus. DS: It’s up to you, Matt, and up to any reviewer, to determine what it is. Perhaps it’s being called a film because of the fact that it holds together as a mammoth narrative. That’s what we hoped for in the editing room. Has the experience of delving this deeply into these students’ lives changed you in any way? LS: I thought of myself as a liberal white person when I went into this project. I don’t want to say that I was “woke,” but I had liberal sensibilities and welcomed diversity. I can say without any doubt that I am the audience for “America to Me.” I learned a lot by going deep into this subject, and I walked away a changed person, awakened to the fact that our country is f—ed. The inequity illustrated in the show is deeply embedded in the institutions of our entire country, and they require so much change. I am very hopeful that if more people watch this show, we can at the very least start having this conversation more often. I would hope that people will walk away from it feeling as I did. AS: I don’t have kids, so I don’t have a grasp on what the youth of today is like, but each of the kids that we followed were incredible people. I have an immense hope for future generations. They’re the ones who can bring about change. I know every generation says that, but these kids were so smart and savvy about media and the state of race in the world. I’ve definitely come away more hopeful. DS: I would echo both of my esteemed colleagues. Like Leslie, I consider myself a progressive person, but I think in the course of working on the series, I became aware of really common, white, progressive blind spots or ways that I fit comfortably in my privilege. I also became aware of just how much grist for the mill there is—how much needs to be discussed and how much pain exists in other people’s lives. Not only extreme and stark pain, but pain generated from a different experience of living in this society. It got me thinking of how different certain experiences can be for different people. I think it’s the perfect time for this series to land in terms of our national discussion about race and privilege and the variety of experiences among those living in American society. The discussions it has been generating already online and with people I’ve conversed with who have seen it make me really hopeful that we can all have more and deeper conversations along the lines that the series provokes. “America to Me” airs Sundays at 9pm CST on STARZ. For more info, visit the official Kartemquin site.